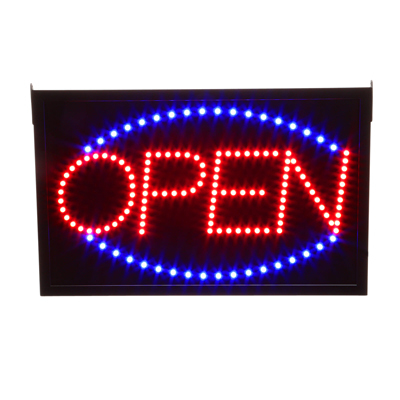 LED Open Sign has red OPEN lettering and a blue oval border that is visible day or night. Encased in an elegant rectangular black frame. 3 animated functions - Chasing, Flashing or constant on. Lightweight, easy to hang and plugs into any 110v outlet. Includes a remote control and a hanging chain.